If you’ve watched Darryl Erdmann’s career over the years, you may have come to suspect that there’s a good dose of the frustrated sculptor in this consummate painter. By incorporating found and constructed elements in some of his works, Erdmann has at times branched out into the physically sculptural (pun intended, in the case of the painting of his at the Salt Lake City International Airport that features an attached tree branch), but even his works that remain two-dimensional have a very definite evocation of the three-dimensional world. Erdmann’s painterly interests shift from year to year, from the crispy rectilinear to brushy expressionism, but even in the latter, and especially in the former, there’s a playful intersecting of planes and lines and basic geometric forms, suggesting an abiding interest in the conceptualization of a three-dimensional world with the tools of a two-dimensional one. 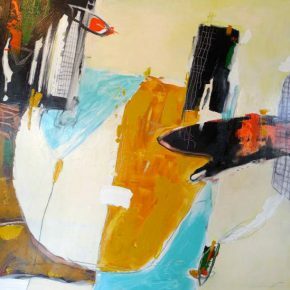 Erdmann’s current show at Finch Lane Gallery, which he shares with Kristina Lenzi, features a dozen or so mature works from the past several years. 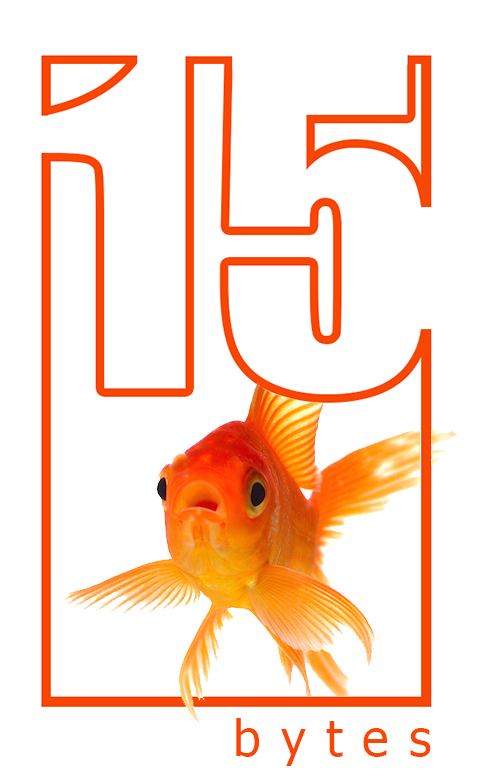 They are cerebral works, but also very playful. In “Pictograph #123” a pie-slice shaped piece of beige, its bottom point folded like a marked page in a book, is pierced by a red line that travels upward off the surface and downwards toward a rectangular mass of blue. Dotted lines and falling bars of color, as well as geometric shapes that change hue where they overlap each other, further establish competing planes to evoke the fantasies of a would-be geometry teacher. 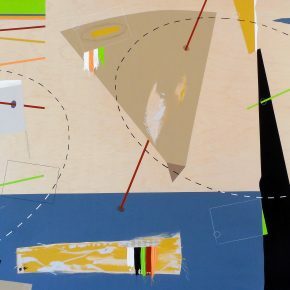 The elements of play are reduced in pieces like “Still” (2015) and “Recital” (2007), where just a few rectangles float on a field of carmine or lemon yellow, the dynamism of the composition dependant on the competing weight of these “objects.” The paintings’ successes also rely on the small touches, the playful jokes inserted by Erdmann, like the squiggle in “Recital” that changes from yellow to red as it meanders its way across the canvas. 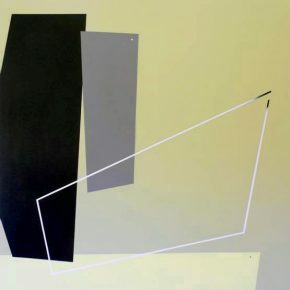 “Valence” (2015) and “Impasse Two” (2015) share a joke: in both, a white line describes what would be a parallelogram if only the lines could meet and close at the fourth corner: where they don’t, and instead end inches above each other, the white shifts to a darker color as if to emphasize the unmet expectations of a geometrically sealed world unfulfilled. These paintings are executed in such a hard-edged manner, the paint so utterly flat, you would think they are printouts of works created on a computer. 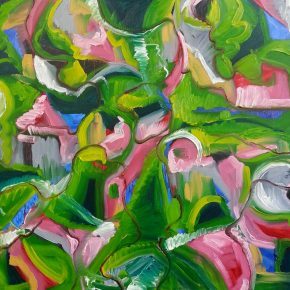 This bravura display of Erdmann’s impersonal control of his medium is a playful counterpoint to his other works, which can be as expressionistic as these are flat. The painterly approach in “Acquiesce,” (2015) has made the overlapping geometric forms less obvious, but they are still there, helping to create plenty of push and pull, as if Hans Hofmann was introduced to a compass and ruler. In the past year, Erdmann has given vent to the sculptor within through works that actually use three-dimensional layers rather than simply evoking them with drawing and painting. 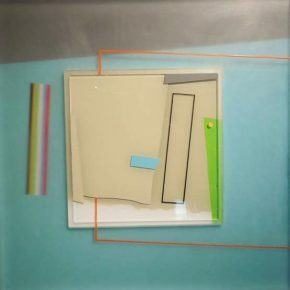 “Alone” (2015) displays the same repertoire of geometric forms in his larger canvases, but here they are embedded in sheets of Plexiglas, sometimes very thick sheets, which obscure some elements and reveal others. In “Que” and “Ajar,” Erdmann has added sheets of perforated steel and copper as substitutes for paint, as if the shop teacher too has broken into the art class, to make merry with his colleague from the math department. 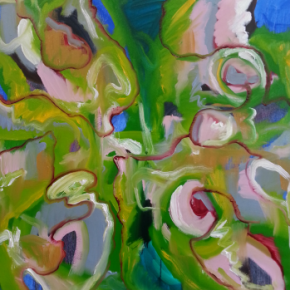 Her works at Finch Lane are a playful series of paintings that share a bright color palette and looping swirls of brushwork. Thick orbs of color push each other across the canvas, occasionally defined by looping lines of color. These paintings borrow from Kandinsky’s nonobjective improvisations, as suggested by a tall vertical painting above the gallery’s fireplace, which the artist has titled “”When Kandinsky Met Kermit and Yoda.” Kermit and Yoda are recurring characters in these paintings’ titles, as is that other Henson creation, Miss Piggy: “Apparition of Miss Piggy before Kermit and Yoda” is the title of one piece, “Yoda showing Kermit the Light Side” that of another. Whether they are characters in the actual paintings is in the eye of the beholder. 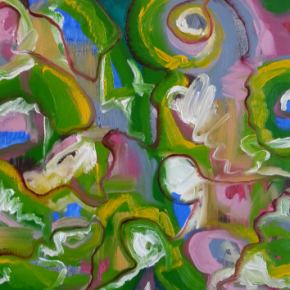 A particular swish of the brushstroke may create something that looks amphibian or snout-like, in a puppet sort of way; but just as likely, the titles are inspired by the bold color palette: the bright greens and pinks call to mind someone (a performance artist?) smashing chunks of watermelon on the canvas and spreading them about until they turn into paint. Either way, they suggest that Lenzi, too, is being playful, if not downright silly. Which may be a restful counterpoint to Lenzi’s performance practice, which she has said is about “real people doing real things in real time.” As performance, though, rather than actual lived life, such acts are masks that enact these things rather being them. Not unlike a puppet, whether pig, frog or alien, acting as if they were real people doing real things in real time. Finch Lane Gallery, 54 Finch Lane in Reservoir Park, 1340 E. 100 South, Salt Lake City, presents Darryl Erdmann and Kristina Lenzi running through November 20.